Miguel López de Legazpi (Spanish pronunciation: [miˈɣel ˈlopeθ ðe leˈɣaθpi]; c. 1502 – August 20, 1572), also known as El Adelantado and El Viejo (The Elder), was a Basque-Spanish navigator and governor who established the first Spanish settlement in the East Indies when his expedition crossed the Pacific Ocean from the Viceroyalty of New Spain in modern-day Mexico, arrived in Cebu of the Philippine Islands, 1565. He was the first Governor-General of the Spanish East Indies which included the Philippines and other Pacific archipelagos, namely Guam and the Marianas Islands. After obtaining peace with various indigenous nations and kingdoms, Miguel López de Legazpi made Manila the capital of the Spanish East Indies in 1571. 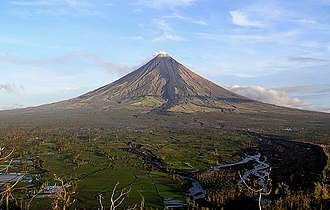 The capital city of the province of Albay bears his name. In 1528, Hernán Cortés established settlements in North America and López de Legazpi traveled to Mexico (New Spain) to start a new life. This was due to the death of his parents and his dissatisfaction with his eldest sibling, who inherited the family fortune. In Tlaxcala, he worked with Juan Garcés and Juan's sister, Isabel Garcés. López de Legazpi would go on to marry Isabel and have nine children with her. Isabel died in the mid-1550s. Between 1528 and 1559 he worked as a leader of the financial department council and as the civil governor of Mexico City. A route of the Spanish expeditions in the Philippines. In 1564, López de Legazpi was commissioned by the viceroy, Luis de Velasco, to lead an expedition in the Pacific Ocean, to find the Spice Islands where the earlier explorers Ferdinand Magellan and Ruy López de Villalobos had landed in 1521 and 1543, respectively. The expedition was ordered by King Philip II of Spain, after whom the Philippines had earlier been named by Ruy López de Villalobos. The viceroy died in July 1564, but the Audiencia and López de Legazpi completed the preparations for the expedition. On November 19 or 20, 1564, five ships and 500 soldiers, sailed from the port of Barra de Navidad, New Spain, in what is now Jalisco state, Mexico (other sources give the date as November 1, 1564, and mention 'four ships and 380 men'). Members of the expedition included six Augustinian missionaries, in addition to Fr. Andrés de Urdaneta, who served as navigator and spiritual adviser, Melchor de Legazpi (son of Adelanto de Legazpi), Felipe de Salcedo (grandson of Miguel Lopez de Legazpi), and Guido de Lavezarez (a survivor of the expedition of Ferdinand Magellan). López de Legazpi and his men sailed the Pacific Ocean for 93 days. 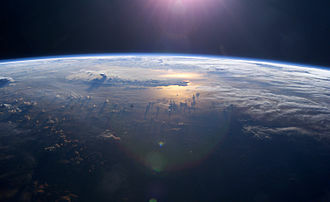 In 1565, they landed in the Mariana Islands, where they briefly anchored and replenished their supplies. 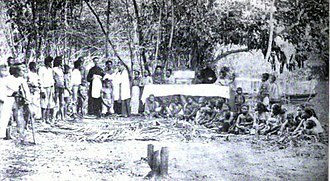 There they fought with Chamorro tribes and burned several huts. In 1570, having heard of the rich resources in Luzon, Legazpi dispatched Martín de Goiti to explore the northern region. Landing in Batangas with a force of 120 Spaniards, de Goiti explored the Pansipit River, which drains Taal Lake. :79 On May 8, they arrived in Manila Bay. There, they were welcomed by the natives. Goiti's soldiers camped there for a few weeks while forming an alliance with the Muslim leader, Rajah Ache, who was a vassal under the Sultan of Brunei. Legazpi wanted to use Manila's harbor as a base for trade with China. However, the Rajah's ally in northern shores of Manila Bay, historically known as the young Bambalito of Macabebe, asked Rajah Soliman (Old Ache) to revoke his alliance with the Spaniards. Rajah Matanda refused because of the "word of honor" of the Spaniards. 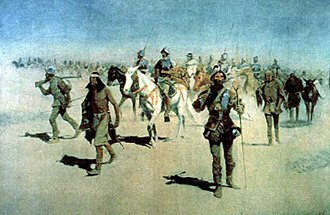 Rajah Soliman had his conditions for Bambalito that if they were able to kill as least 50 Spaniards, he would revoke his alliance with Legazpi, and the old ache would help to expel the conquerors. Bambalito rode back to Macabebe and formed a fleet of two thousand five hundred moros consisting of soldiers from the villages along Manila Bay particularly from Macabebe and Hagonoy. On May 30, 1570, Bambalito sailed to Tondo with Caracoas and encountered the Spaniards at Bangkusay Channel, headed by Martin de Goiti on June 3, 1571. Bambalito and his fleet had lost the battle, and after disputes and hostility had erupted between the two groups, the Spaniards occupied the Islamized states of Tondo and Maynila. Manila was prepared by Goiti for Legazpi who left Panay. In the same year, more reinforcements arrived in the Philippines, prompting López de Legazpi to leave Cebu for Panay and then for Luzon. He recruited 250 Spanish soldiers and 600 native warriors to explore the regions of Leyte and Panay. The following year he followed Goiti and Salcedo in Manila, after hearing that the villages had been conquered. During the early phase of the exploration of the northern part of the Philippines, López de Legazpi remained in Cebu, and did not accompany his men during their conquest of Manila, because of health problems and advanced age. In Manila, López de Legazpi formed a peace pact with the native councils as well as the local rulers, Rajah Sulayman and Lakan Dula, Lakan and Rajah are same title of the native royalty. Both groups agreed to organize a city council, consisting of two mayors, twelve councilors and a secretary. López de Legazpi established a settlement there on June 24, 1571, and he also ordered the construction of the walled city of Intramuros. He proclaimed the town as the island's capital, and the seat of the Spanish government in the East Indies. 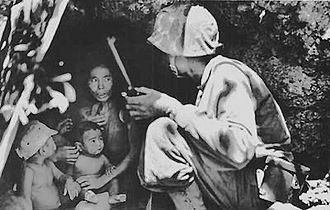 Upon the defeat of Bambalito, Legazpi orders the exploration of the villages north of Manila. In September 1571, Goiti pacified Lubao and Betis, using riverine tributaries of Rio Chico, then he reached the settlements in Calumpit and Malolos on November 14, 1571 and other old villages mostly along Manila Bay. Legazpi had established a government on the islands and went on to become the first Spanish governor of the Philippines. López de Legazpi governed the Philippines for a year before dying suddenly of a stroke in Manila on August 20, 1572 after scolding an aide. He died poor and bankrupt, leaving a few pesos behind,[quantify] due to having spent most of his personal fortune during the conquest. He was laid to rest in San Agustin Church, Intramuros. By the time of López de Legazpi's death, the parts of the Visayas had passed to Spanish rule. The Spanish met strong resistance from Muslim sultanates on the island of Mindanao, the Zambal tribes of Zambales, and the Igorot of the Cordilleran mountains, as well as some Wokou pirates from China and Japan. 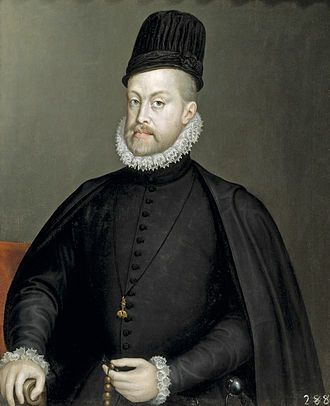 During his last years, López de Legazpi wrote several letters to Philip II of Spain about his journey to the East Indies, and the conquest he had achieved. These were collectively known as the "Cartas al Rey Don Felipe II: sobre la expedición, conquistas y progresos de las islas Felipinas" (Letters to the King Lord Philip II: on the expedition, conquests, and progress of the Philippine Islands). The letters are still preserved today at the General Archive of the Indies in Seville, Spain. At the time of Legazpi's arrival, the natives of the archipelago practiced Islam, Hinduism, Buddhism and animism. Part of the motivation of the Spaniards was to evangelize population and convert people to Roman Catholicism. After the islands had been conquered by the sovereign light of the holy gospel which entered therein, the heathen were baptized, the darkness of their paganism was banished and they changed their own for Christian names. The islands also, losing their former name, took — with the change of religion and the baptism of their inhabitants — that of Filipinas Islands, in recognition of the great favors received at the hands of his Majesty Filipe the Second, our sovereign, in whose fortunate time and reign they were conquered, protected and encouraged, as a work and achievement of his royal hands. Legazpi and Urdaneta's expedition to the Philippines effectively created the trans-Pacific Manila galleon trade, in which silver mined from Mexico and Potosí was exchanged for Chinese silk, porcelain, Indonesian spices, Indian gems and other goods precious to Europe at the time. The trade route formed an important commercial link between Latin America and the Asia-Pacific with the trade products even carried over to Europe via the Havana Galleons, while heavily financing the Spanish Empire. The introduction of Western ingredients, goods, and imperialism brought about the 'Hispanization' of the islands. The Hispanization process escalated the degree of slavery and the consistent persecution of traditional ethnic religions. For the next 333 years, from 1565 when Spain first established a colony in the country until the Treaty of Paris on December 10, 1898, the Philippines was a Spanish colony (including the years 1762–1764 when the British controlled Manila and the port city of Cavite but not the whole country). Portrayed by Mark Gil in the 2013 TV series, Indio. His mortal remains are in the San Agustin Church, Manila. De Morga, Antonio (2004). History of the Philippine Islands. Volume 1 and 2. Project Gutenberg. López de Legazpi, Don Miguel (1564–1572). 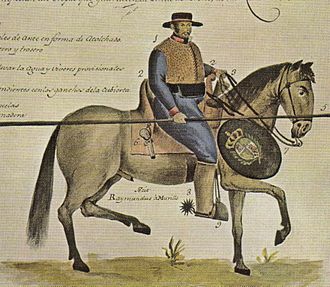 "Cartas al Rey Don Felipe II: sobre la expedicion, conquistas y progresos de las islas Felipinas". Sevilla, España. ^ a b c d e M.c. Halili (2004). Philippine History' 2004 Ed.-halili. Rex Bookstore, Inc. ISBN 978-971-23-3934-9. ^ "Philippine eLib Portal". www.elib.gov.ph. 2008-06-16. Retrieved 2015-12-06. ^ Mann, Charles C. (2012). 1493: Uncovering the New World Columbus Created. Random House Digital, Inc. p. 32. ISBN 978-0-307-27824-1. Retrieved 28 August 2012. ^ Serag, Sebastian Sta. Cruz (1997). The Remnants of the Great Ilonggo Nation. Rex Bookstore, Inc. p. 160. ISBN 978-971-23-2142-9. ^ Stanley Karnow, In our Image: America's Empire in the Philippines, pg 47. ^ Antonio de Morga. "History of the Philippine Islands". Project Gutenburg. Retrieved 2004-12-01. Wikimedia Commons has media related to Miguel López de Legazpi. Italics indicates a member of the clergy of the Roman Catholic Church. Smallcaps indicates an oidor of the Real Audiencia of Manila. Intramuros is the oldest district and historic core of Manila, Philippines. It is called the Walled City, and at the time of the Spanish Colonial Period was synonymous to the city of Manila itself and it was the seat of government when the Philippines was a component realm of the Spanish Empire. Districts beyond the walls were referred as the extramuros of Manila, construction of the defensive walls was started by Spanish colonial government in the late 16th century to protect the city from foreign invasions. The 0. 67-square-kilometre walled city was located along the shores of the Manila Bay. Guarding the old city is Fort Santiago, its located at the mouth of the river. Land reclamations during the early 20th-century subsequently obscured the walls and fort from the bay, Intramuros was heavily damaged during the battle to recapture the city from the Japanese Imperial Army during the Second World War. Reconstruction of the walls was started in 1951 when Intramuros was declared a National Historical Monument, the region was invaded around 1485 by Sultan Bolkiah and became a part of the Sultanate of Brunei. The site of Intramuros became a part of the Islamic Kingdom of Maynila a Bruneian puppet-state ruled by Rajah Sulayman, a Muslim Rajah who swore fealty to the Sultan of Brunei. In 1564, Spanish explorers led by Miguel López de Legazpi sailed from New Spain, having heard of the rich resources in Manila from the natives, Legazpi dispatched two of his lieutenant-commanders, Martín de Goiti and Juan de Salcedo to explore the island of Luzon. The Spaniards arrived on the island of Luzon in 1570, after quarrels and misunderstandings between the Islamic natives and the Spaniards, they fought for the control of the land and settlements. Legazpi declared the area of Manila as the new capital of the Spanish colony on June 24,1571 because of its strategic location and he proclaimed the sovereignty of the Monarchy of Spain over the all the archipelago. King Philip II of Spain delighted at the new conquest achieved by Legazpi and his men, awarded the city a coat of arms and declaring it as, Intramuros was settled and became the political and religious center of the Spanish Empire in Asia. Jalisco, officially the Free and Sovereign State of Jalisco, is one of the 31 states which, with the Federal District, comprise the 32 Federal Entities of Mexico. It is located in Western Mexico and divided into 125 municipalities, Jalisco is one of the most important states in Mexico because of its natural resources as well as its history. Many of the traits of Mexican culture, particularly outside Mexico City, are originally from Jalisco, such as mariachi, ranchera music, tequila, jaripeo. Hence, the motto, Jalisco es México. Economically, it is ranked third in the country, with industries centered in the Guadalajara metropolitan area, the state is home to two significant indigenous populations, the Huichols and the Nahuas. There is a significant foreign population, mostly retirees from the United States and Canada, living in the Lake Chapala, with a total area of 78,599 square kilometers, Jalisco is the seventh-largest state in Mexico, accounting for 4. 1% of the countrys territory. Jalisco is made up of a terrain that includes forests, plains. Altitudes in the state vary from 0 to 4,300 meters above sea level, over 52% of the bird species found in Mexico live in the state, with 525, 40% of Mexicos mammals with 173 and 18% of its reptile species. There are 7,500 species of veined plants, one reason for its biodiversity is that is lies in the transition area between the temperate north and tropical south. Its five natural regions are, Northwestern Plains and Sierras, Sierra Madre Occidental, Central Plateau, Trans-Mexican Volcanic Belt, which covers most of the state, and it has an average altitude of 1,550 meters MASL, but ranges from 0–4,300 m. Most of the territory is semi-flat between 600–2,050 m, followed by rugged terrain of between 900–4,300 m and a percentage of flat lands between 0–1,750 m. Jalisco has several river basins with the most notable being that of the Lerma/Santiago River, the Lerma River enters extends from the State of Mexico and empties into Lake Chapala on the east side. On the west, water flows out in the Santiago River, tributaries to the Santiago River include the Zula, the Verde River, the Juchipila and the Bolaños. The Spanish East Indies were the Spanish territories in Asia-Pacific from 1565 until 1899. They comprised the Philippines, the Mariana Islands, the Caroline Islands, Cebu was the first seat of government, transferred to Manila. From 1565 to 1821 these territories, together with the Spanish West Indies, were administered through the Viceroyalty of New Spain based in Mexico City, the King of Spain traditionally styled himself King of the East and West Indies. After Mexican independence, they were ruled directly from Madrid, administrative affairs of the Spanish East Indies were handled by the Captaincy General of the Philippines and the Real Audiencia of Manila. The few remaining islands were ceded to the United States when the Treaty of Washington was ratified in 1901, Spanish contact began on 6 March 1521, when a Spanish expedition led by Ferdinand Magellan reached the Mariana Islands. He named Guam and the other islands Islas de los Ladrones because the natives came aboard his galleon, the expedition continued its journey west and reached the island of Homonhon in the eastern Philippines on 16 March, with only 150 crewmen. There they were able to communicate with the local peoples because the Malayan interpreter, Enrique of Malacca, Miguel López de Legazpi set out from Mexico, and established the first Spanish settlement in the Philippines in 1565, which became the town of San Miguel in present-day Cebu. In 1571, the city of Manila was founded and made seat of the Spanish Captaincy General of the Philippines and these and other Asian territories claimed by the Spanish crown were to be governed from the Viceroyalty of New Spain in Mexico City. 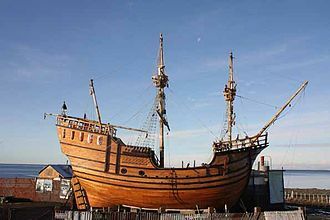 The Manila-Acapulco galleons shipped products gathered from both Asia-Pacific and the Americas, such as silk, silver and other Asian-Pacific islander products to Mexico, in 1606, the Spaniards established some form of trade links with the Maluku Islands and remained until 1663. Contacts with Japan were established and Sebastián Vizcaíno was sent as ambassador in 1611, on the north eastern coastal region of Taiwan, the Spaniards built Fort Santo Domingo near Keelung in 1626 and a mission in Tamsui in 1628, which they occupied until 1642. In 1668, Blessed Diego Luis de San Vitores established the first mission on Guam, in 1762 British troops briefly captured the city of Manila during the Seven Years War. The British promised support for an uprising led by Diego Silang and his wife Gabriela, under the peace settlement Manila was exchanged, along with British-occupied Havana, for Florida and Minorca. It was handed back to Spanish authorities in April 1764, the Seven Years War prompted Charles III to initiate extensive governmental reforms throughout the overseas possessions. An intendencia was established in Manila in 1784 to handle the government finances, in a similar vein, to promote innovation and education among the residents of the islands, Governor-General José Basco y Vargas established the Economic Society of the Friends of the Country. For over 256 years, the Spanish East Indies were governed by a general. 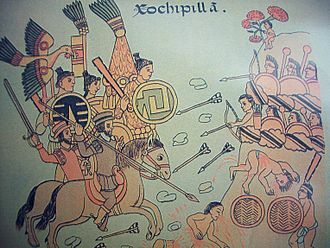 All economic matters of the Philippines were managed by the Viceroyalty of New Spain, in 1821 the New Spanish Viceroyalty collapsed following the Mexican War of Independence, which resulted in the First Mexican Empire. The Captaincy General of the Philippines was an administrative district of the Spanish Empire. The Captaincy General encompassed the Spanish East Indies, which included the Philippine Islands and it was founded in 1565 with the first permanent Spanish settlements. 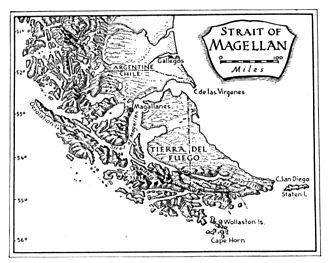 However, in 1821, following the independence of Mexico, all control was transferred to Madrid, antonio Pigafetta, the expeditions chronicler and one of only 18 original crew members to survive Ferdinand Magellans circumnavigation of the globe, recorded all details of the voyage. On 5 June 1569, Guido de Lavezaris, the treasurer in the Archipelago. A letter from another official, Andres de Mirandaola, described briefly this encounter with the Portuguese, the danger of another attack led the Spaniards to remove their camp from Cebu to Panay, which they considered a safer place. Legazpi himself, in his report to the Viceroy in New Spain and it was in Panay that the conquest of Luzon was planned, and launched on 8 May 1570. Two of Lepazpis Lieutenant-commanders, Martín de Goiti and Juan de Salcedo conquered Luzons northern region, in 1574 the Captaincy General of the Philippines was created as a dependency of the Viceroyalty of New Spain. They were the representative of the executive of the ruling power. On November 15,1935, the Commonwealth of the Philippines was established as a government to prepare the country for independence from the American control. The governor-general was replaced by an elected Filipino President of the Philippine Commonwealth, as the executive of the Philippines. The former American Governor-General became known as the High Commissioner to the Philippines, from 1565 to 1898, the Philippines was under Spanish rule. From 1565–1821, The governor and captain-general was appointed by the Viceroy of New Spain upon recommendation of the Spanish Cortes, when there was a vacancy, the Royal Audiencia in Manila appoints a temporary governor from among its members. 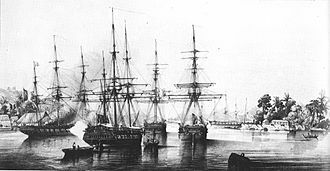 Ad interim Real Audiencia Great Britain occupied Manila and the port of Cavite as part of the Seven Years War. 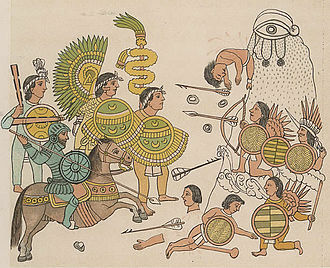 After the 1821 Mexican War of Independence, Mexico became independent and was no part of the Spanish Empire. The Viceroyalty of New Spain ceased to exist, the Philippines, as a result, was directly governed from Madrid, under the Crown. The American military government was established following the defeat of Spain in the Spanish–American War, during the transition period, executive authority in all civil affairs in the Philippine government was exercised by the military governor. For the first year, a Military Governor, Adna Chaffee, ruled parts of the still resisting the American rule, concurrent with civil governor. Disagreements between the two were not uncommon, the following year, on July 4,1902, Taft became the sole executive authority. Chaffee remained as commander of Philippine Division until September 30,1902, the title was changed to Governor General in 1905 by an act of Congress. The term insular refers to U. S. island territories that are not incorporated into either a state or a federal district, all insular areas was under the authority of the U. S. Bureau of Insular Affairs, a division of the US War Department. On November 15,1935, the Commonwealth of the Philippines was inaugurated as a government to prepare the country for independence. 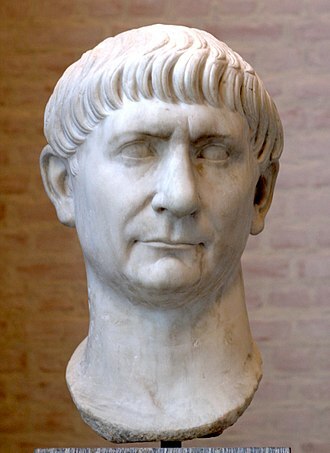 It was established by 10 leaders called Datus. They were connected with the court of Indianized native kingdoms of Brunei and Srivijaya, who were forced to leave that land on account of enmity with the Rajah, the local folklore says that the name of the Bornean Rajah was Makatunao. They embarked on sailing rafts of the used by the Visayans in Sumatra. The semi-democratic confederation or Kedatuan was integrated to the Spanish Empire through pacts and treaties by Miguel López de Legazpi, during the time of their hispanization, the principalities of the Confederation were already developed settlements with distinct social structure, culture and religion. Among the archaeological proofs of the existence of this Hiligaynon nation are the found in pre-Hispanic tombs from many parts of the island. There are recent discoveries of artifacts of eight-foot inhabitants of Isla de Gigantes, including extra-large Lungon. One of these Westerners accounts says that the tales regarding adventures of this ancient hero of Panay were being retold during wedding celebrations in form of songs, Madja-as was a pre-colonial Indianized kingdom. The polity of Pannai was a militant-nation allied under the Sri-Vijaya Mandala that defended the conflict-ridden Strait of Malacca, the Chola invaders eventually destroyed the polity of Pannai and its surviving soldiers and scholars were said to have been secreted-out eastwards. In their 450 years of occupying Sumatra, they refused to be enslaved to Islam, the people who stayed behind in Pannai, have an oral tradition wherein they said that the high-borne scholars and nobles of Pannai, fled to other islands. The following is the account of P. Francisco Colin. One of these groups was subjugated there and they were unable to flee for various circumstances. Someone speaking pampango found out that they were not speaking pampango among themselves, but they donned the old pampango ethnic costume. And when he addressed an old man among them, the replied, You are descendants of the lost, that in times past left this place to settle in other lands, and nothing was heard about them again. Colins experience in Sumatra resonates the local tradition in the Visayan island of Panay, recorded in the Maragtas and it is good to note that the word maragtas in the Hiligaynon language means history. 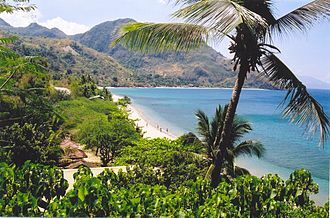 Mindoro is the seventh-largest island in the Philippines. It is located off the coast of Luzon and northeast of Palawan, the southern coast of Mindoro forms the northeastern extremum of the Sulu Sea. In past times, it has been called Ma-i or Mait by Han Chinese traders and by Spaniards, according to the late historian William Henry Scott, an entry in the official history of the Sung Dynasty for the year 972 mentions Ma-i as a trading partner of China. Other Chinese records referring to Ma-i or Mindoro appear in the years that follow, the island was briefly ruled by the Sultanate of Brunei and housed Moro settlements before the Spanish invaded and Christianized the population. From 1920 to 1950, the island was a province with Calapan City as the provincial capital. In 1950, it was partitioned into its two present-day provinces, Occidental Mindoro and Oriental Mindoro, following a referendum that was pushed through by acting governor Romeo Venturanza, the island was the location of the Battle of Mindoro in World War II. The economy of Mindoro is largely based on agriculture, products consist of a wide variety of fruits, such as citrus, lanzones and coconuts, sugarcane, fish and poultry. Logging and the mining of marble and copper thrive, tourism is a lucrative business as well, with locations such as Apo Reef National Park, Lubang Island, Puerto Galera, Sabang Beach and Mount Halcon. Puerto Galeras beaches are the islands most known tourist attraction and are widely visited, the principal language in Mindoro is Tagalog, although in some parts it has been greatly influenced by the native Mangyan and Visayan languages. Mainstream Standard Filipino and Taglish are, present in and around such areas as Calapan City, Puerto Galera and San Jose. Visayan and Mangyan languages, are spoken on the island, as are Ilocano and some foreign languages — e. g. English, the following indigenous languages are spoken in Mindoro. The religion of the indigenous Mangyan population is animism, Mindoro is home to the tamaraw or Mindoro dwarf buffalo, which is endemic to the island. There are around 13 indigenous communities, of which the majority have converted to the religion of Islam and are now Muslims or Moros, most are the followers of Islam of the Shafii madhhab. The term Moro came into use during the Spanish colonial period by the Spaniards and it was originally used to refer to the Berber/Arab Muslims who ruled Muslim Spain, but for a time it came to be used informally by the Spaniards to refer to all Muslims. The term is self-prescribed by the communities themselves, on both declarations, the signatories used the word, Moro Nation which translates as Bangsa Moro. In modern history, influential groups such as the Moro National Liberation Front espoused the Moro identity to unify all Muslim groups in the Philippines and this is different from the Filipino identity as it was more seen as an epithet to Catholic converted ethnic groups. The Moro people mostly live in Mindanao and Palawan, many Moros have emigrated to Malaysia and Brunei in the last half of the 20th century due to the conflict in the Southern Philippines. Newer communities can be today in Kota Kinabalu, Semporna in neighbouring Sabah, North Kalimantan in Indonesia. The recently coined term Bangsamoro, derived from the old Malay word bangsa, the term Bangsamoro carries the aspiration of the Filipino Muslims to have an Islamic country or state. The term was used again by the Spanish when they arriving in the Philippine archipelago. Marvic Leonen, who was the Chief Peace Negotiator for Philippine government with the Moro Islamic Liberation Front, has said, There is Bangsamoro, the place, there is Bangsamoro, the identity. The established historical and political factors of the Moro communities made them a separate country unethically annexed to the emerging Philippine Republic. It was adopted as a name for separatist organisations such as the Moro National Liberation Front, the Framework Agreement on the Bangsamoro recognises Bangsamoro as an identity and calls for the creation of a new autonomous political entity called Bangsamoro. The native Moro Communities of Mindanao and Sulu are termed considered as Filipino Muslim by the Philippine government and it includes the cities of Cotabato, Dipolog, General Santos, Marawi. Manila, officially City of Manila, is the capital of the Philippines. Founded on June 24,1571, by Spanish conquistador Miguel López de Legazpi and it is situated on the eastern shore of Manila Bay and is home to many landmarks, some of which date back to the 16th century. In 2012, the Globalization and World Cities Research Network listed Manila as a global city, the city proper is home to 1,780,148 people in 2015, forming the historic core of Metro Manila, the capital region of the Philippines. The metropolitan area, which includes the much larger Quezon City, Manila is the most densely populated city proper in the world, with 41,515 people per square kilometer. The term Manila is commonly used to refer to either the whole area or the city proper. Manila is located on the shore of the Manila Bay on one of the finest harbors in the country. The city has six districts for the lower house of the Philippine Congress. Manila was once ruled by the Kingdom of Tondo before it became a province of the Majapahit Empire. During the Bruneian invasion of the Philippines, Sultan Bolkiah of Brunei captured Seludong and renamed it Maynilà, Maynilà became a vassal state of the Sultanate of Brunei, established to overpower Tondo. 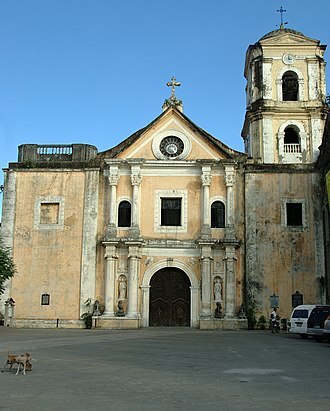 In 1571, conquistadors arrived from Mexico, across the Pacific Ocean, Spanish missionaries soon Christianized the city, incorporated Tondo and built some of the oldest churches in the country, including San Agustin Church. 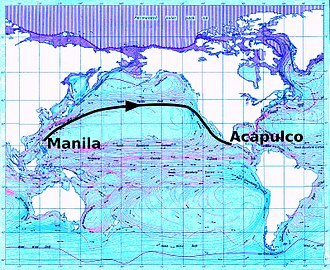 The conquistadors renamed the area Nuevo Reino de Castilla, Manila became the center of Spanish activity in the Far East and one end of the Manila–Acapulco galleon trade route linking Spanish America with Asia, one of the earliest examples of globalization. Because of its location on Pacific trade routes, Manila received the moniker Pearl of the Orient. Spanish rule of the Philippine archipelago lasted for more than three centuries, until 1898, order was usually quickly restored and the city returned to the business of trade. 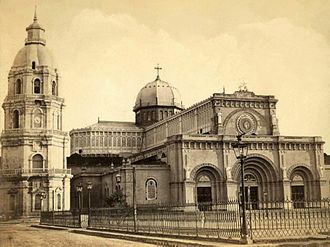 In the 19th century, Manila was one of the most modern cities in Asia, before the Spanish–American War, it saw the rise of the Philippine Revolution. Three indigenous tribal men from the Sulu Archipelago in the 1900s. Maguindanaon Moros performing on the agung using two balus. 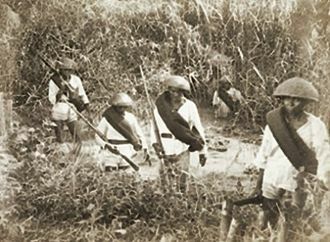 Christian Filipinos who served under the Spanish army in Mindanao searching for Moros in their battle against the Moro Muslim in 1887. The historical landmark in San Joaquin, Iloilo indicating the spot traditionally referred to as the site of the Barter of Panay. Bas relief of the Barter of Panay at the facade of the municipal gymnasium of the town of San Joaquin, Iloilo (Panay), Philippines - the town to where the place of landing of the ten Bornean Datus now belongs. The world in 13th century; shows the Visayan realm and its neighbors. Ruins of Guma Taga on Tinian. 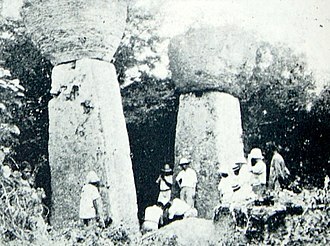 The pillars/columns are called latte (pronounced læ'di) stones, a common architectural element of prehistoric structures in the Mariana Islands, upon which elevated buildings were built. Earthquakes had toppled the other latte at this site by the time this photo was taken; an earthquake in 1902 toppled the one seen on the left, and today only the one on the right remains standing. A U.S. Marine talks a terrified Chamorro woman and her children into abandoning their refuge. Battle of Saipan, 1944. Routes of early Spanish expeditions in the Philippines. Manila, capital of the Spanish East Indies, 1899.